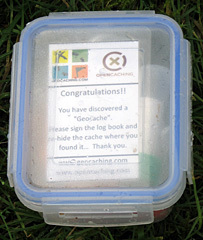 As I had been getting a few FTF’s lately when a local cache was published late one evening up on Ilkley Moor I decided that I would set off to work early and go and find it, however, by first thing the next morning another new cache had appeared down by the river less than a mile away from home… so I had a dilemma, which do I go for ? The cache was easy to find hidden in an ivy covered tree, however there is more than one ivy covered tree in the vicinity – and a strand of barbed wire between them which was quite difficult to see because of the ivy – fortunately I came across a wire bit of it rather than a barb ! As I’d not gone for this on the way to work for the FTF this became a lunchtime cache, an easy enough climb up from the road and as expected other cachers had been there before me (I was the third to sign the log book). The description talks about the great views from the cache site butI couldn’t see any views at all as the mist was limiting visibility to about 20 yards !